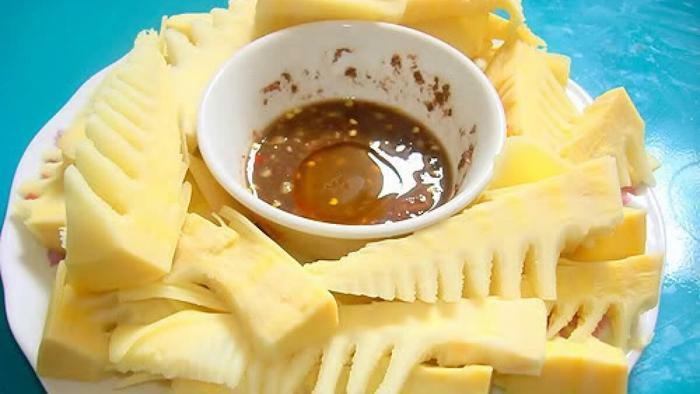 Hoa Binh bamboo shoot is a kind of bamboo shoot that has a bitter taste, but it is used to make delicious dishes. It is a favorite of many people as one of Mai Chau’s specialties in the Northwest forest. Bitter bamboo shoots are the seedlings of bamboo, cane growing in the thick forest. When the new one sprouts only 1-2 finger length and the rest lie under the ground, Hoa Binh people start to collect to sell. Bitter bamboo shoots in Mai Chau tend to have a bit of sweetness, but when it rains, they turn to a characteristic bitterness. Bitter bamboo shoots can be processed into many different dishes such as stir-fry dish, fish soup, sour soup. 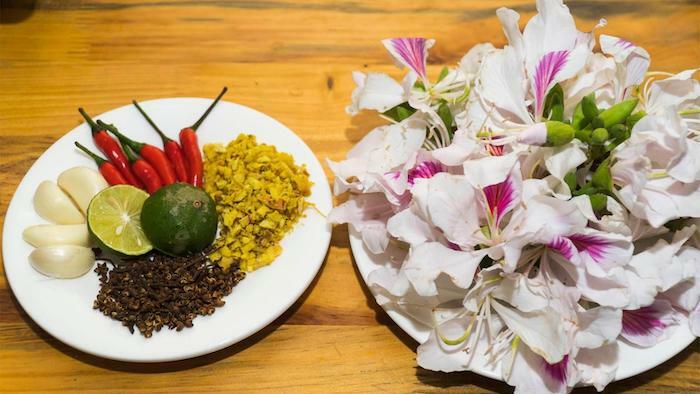 They are favorite foods of Hoa Binh people as well as many tourists who have tasted even once. Peeling to see the white and soft shoot body, people can feel a bitter taste, but there is a bittersweet flavor. That is the food seducing people and making them cannot forget. The attraction of the bamboo shoots is that once a person eats them, they will want to eat more. 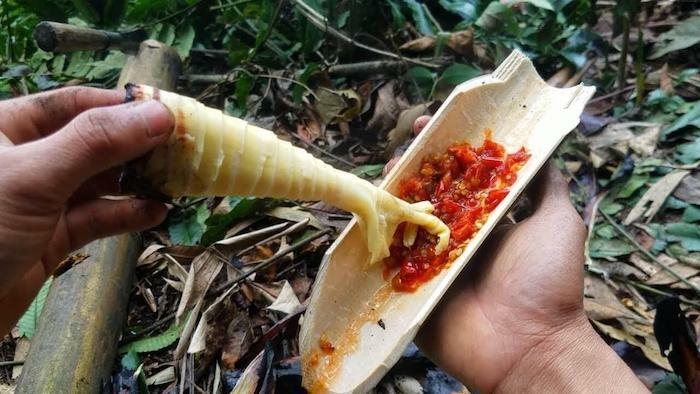 Enjoying austere bamboo shoots is not only about eating but also about the food culture which will make you crave and feel like you’re missing something as the Southern people like to eat chili peppers. Boiling is the most popular that is associated with poverty, the lack of oil on the old days, and it is also convenient. Bitter bamboo shoots brought from the forest should be peeled, sliced into smaller pieces, briefly boiled, drenched with a bit of salt, and soaked in cold water so that it can be in use from now. Just like “mang le” - a kind of bamboo shoots in the Highlands or other types, boiled bamboo shoots with salt and pepper are incredibly delicious. The unique bitterness of the bamboo shoots together with the spicy and salty taste of the pepper salt will bring a very different flavor, making all people enjoy to try. Nevertheless, people here and tourists like to enjoy grilled bamboo shoots with “cham cheo” sauce (including peppers, ginger, “mac khen” seeds, garlic leaves, and garlic) - a must-try dish in Mai Chau. There is only one type of bamboo shoots that the Muong people choose to grill, this is bamboo shoots taken from “danh hanh” tree. This type is not too big just as the wrist. Tasty shoots are the new one that when grilling, it expresses the bitter and sweet smell of burning bamboo shoots and the hot spicy aromas of the “cham cheo” sauce. The dish is associated with the sad love story of the poor guy named Dang (or “Bitter”) with the beautiful girl named Ban. Their love was in restraint, so they fled into the forest. Although, they were exhausted and died, then transformed into bitter bamboo shoots - “ban” flowers, becoming the love legendary of the Northwest. People here still say that if they soak bitter bamboo shoots with “ban” flowers, the bitter taste will disappear. Instead, it will be sweetened slightly. Bitter bamboo shoot - “ban” flower salad is a unique dish that the bitter flavor of bamboo shoots mixes with the sweet smell of flowers, leaving an unforgettable aftertaste. Bitter bamboo shoots grow almost all year round, but the rainy season is the best time that the bamboos robustly flourish. In the Bustling Northern markets, no one is unfamiliar with the stalls which display bitter bamboo shoots. Even in the path to the village, or along the roadside where visitors cross by, we can easily see bunches of bamboo shoots neatly arranged to invite buyers. Previously, around the houses of people here or in the path to the village, it is easy to see the bitter bamboo shoots planted. However, today, austere bamboo shoots are rarer that sometimes, people have to go deeper into the forest to collect. Spring is the sweetest season when to go to Mai Chau Vietnam. At this time, the bees start to collect nectar, and the plants begin to sprout. The young and fresh bamboo shoots reach out of the soil with the others. That is when the bamboo shoots start to turn bitter. According to people who have experience of austere bamboo shoots, at the beginning of the season, its taste is a mix between the sweet and loud flavors, but during days of lightning, rain, and thunder, the bitter bamboo shoots will turn into bitterness very quickly. The harshness gradually increased as the layers shifting from white to green. That is the real harsh bamboo shoots. With a Mai Chau valley trekking tour, visitors will enjoy the delicious dishes made from bitter bamboo shoots, feel the bitter taste that brings exciting feelings. Tourists will always remember the flavor of Mai Chau bamboo shoots which are both strange and familiar specialties of the Northwest forest. Please like and share with others if it is helpful for you. Thank you.